Scotline time charters the fleet of modern vessels controlled by Scotline Marine Holdings Ltd and also manages a number of other vessels, allowing us to operate our regular liner service and also operate in the short-sea spot market. The ships are equipped for and have experience with all sorts of cargoes. Added to this, Scotline has terminal facilities around the UK as well as offering onward distribution, meaning that we offer a door-to-door service. Find out more about our shipping services or get in touch with an enquiry. 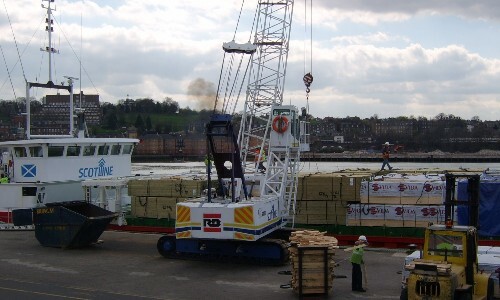 Scotline operates and has exclusive use of terminals in Medway, Transit and Inverness, meaning that we are able to offer a stockholding service, allowing you flexibility between shipping your stock and it arriving at your site. Find out more here. Scotline offer distribution of forest products throughout the UK. Highland Haulage, based in Inverness, operate a fleet of vehicles covering haulage throughout Scotland on behalf of Scotline. The terminals at Rochester are backed up by a fleet of independent specialist hauliers and owner drivers, enabling us to offer distribution throughout England & Wales. Find out more here. Intrada Ships Management Ltd are technical ships managers on behalf of Scotline Marine Holdings Ltd, looking after their fleet of vessels and outside owners. Find out more here. Intrada Chartering Ltd is Scotline’s exclusive brokers, covering all aspects of shipping but specialising in the short sea trade throughout Europe and coaster trades world wide. To get an indication of the types of enquiries that can be handled, click here. Scotline now operates as an independent consultancy and advisers for anyone wishing to enter the shipping industry. If you’re looking to increase the size of your operation or are just after a one-off shipment, but aren’t sure where to start, get in touch with us here.